Our Android smartphone is loaded with so many features that many a time we remain unaware of some important and useful features. Today, in this article we will discuss about a feature, screen pinning that, despite its ability to lock your phone to a specific app remains unexplored. We are not only going to discuss what is screen pinning but also learn how to use it for pinning any app on Android. Although it was introduced way back in Android 5.0, Lollipop, Screen Pinning is one of those features about which a lot of users are still unaware. . This feature allows the users to lock their smartphone to just one app. This means if you have screen pinned your smartphone to one single app then the access of a user using the phone is restricted to that particular app. In other words, your phone is temporarily locked to a specific app making other features and apps completely inaccessible until screen in unpinned. Why Do You Need Screen Pinning on Your Android Phone? Your little kid asks you for your phone to watch his favorite video on YouTube Kids. You do not want him to accidentally delete any of your important emails or documents. You do not want to inadvertently end a game by tapping on home or back button accidentally. Your friend asks for your phone to watch your favorite movie and you have your reservations that he may sneak into your private messages or photos. You are watching your favorite sport and do not want to be disturbed by any sort of calls or notifications. 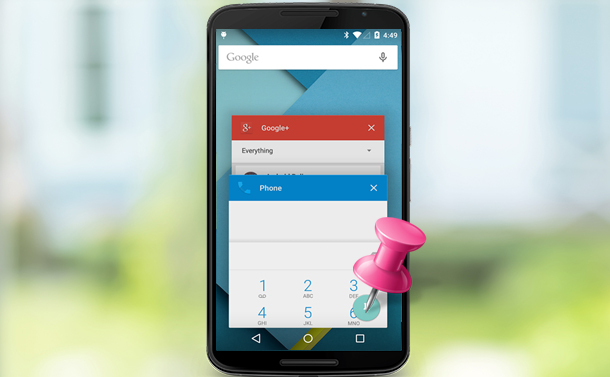 To tackle all the above-mentioned situations all you need is to enable screen pinning on your phone. Screen Pinning is a useful feature of Android that provides your phone an additional layer of security. Also, you do not need to be a tech geek to enable this feature. 1. To get started, tap on Settings icon on your Android Phone. 2. In the Settings menu that opens, tap on Security option. 3. Scroll through the Security settings and tap on Screen pinning. 4. Now toggle the button to the ON position, to enable Screen pinning. 5. After enabling Screen pinning on Android phone also enable Ask for unlock pattern before unpinning. Once it is enabled, now anyone who wishes to unpin the screen has to enter the pin/ pattern/fingerprint (depending on the unlock method you have set for your device). Nothing can be as simple as pinning a screen on Android Phone. 1. To get started open the app screen that you wish to pin. Now tap on overview button that will show you all recent apps that are currently running. Now tap on Pin icon to pin the app on your smartphone. 2. You will get a confirmation message that your screen is pinned. Click on GOT IT to proceed. That’s it. Now you have pinned the screen. Unpinning the screen is again as simple as pinning it. Once your objective of screen pinning is achieved you can easily unpin it by holding the Back and Overview button of your phone at the same time. However, the method of unpinning a screen can vary with the device. As in some smartphones pressing the back button for 2-3 seconds can also unpin the screen. Now, since we have enabled Ask for unlock pattern before unpinning, we have to also enter the unlock pattern. Once entered, the screen is unpinned and you can continue using your device as before. Conclusion: It is hard to believe that in spite of having such a brilliant functionality screen pinning feature is still unknown to many Android users. But we hope that after going through this article our avid readers now get a complete insight of this feature. So next time whenever you are playing your favorite game on your phone, do not forget to use screen pinning.